Driving down the road, I was wishy-washy about hiking in primarily because it was later in the day and at this time of year the sun sets at 7:00pm. 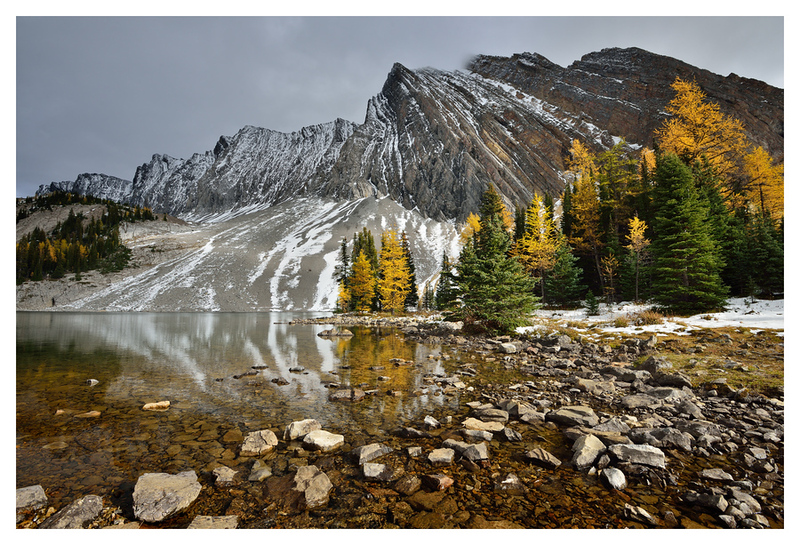 It`s about a 5km hike to the lake with an elevation gain of just over 400m. Eventually I convinced myself to give it a go because the season is short and I'd feel bad if I missed an opportunity. I drove to the trail head and got there around 2:30pm. It took about 15 minutes to get all myself ready for the hike, packing camera gear, changing clothes and so on. There were quite a few cars in the parking lot and there were a number of groups of people exiting the trail. I was slightly nervous to be heading in with everyone coming out. There are bears that hang out around Chester lake and it was just over four hours until dark. I had packed a flashlight and headlamp just in case I lost the light. The sky was quite overcast and darkness could come well before sunset. I started up the path walking as quick as I could, I was just short of jogging. It took about an hour to get to the lake, including stopping to take some photos along the way. As I got to the lake there was another photographer there. He was already setup and taking photos. I asked if I could setup beside him and he smiled and said he thought I would want to. The scene was incredible - the clouds to the south were breaking up and the sunlight was rolling across the scene in front of me. Bands of sunlight would roll across the water, hit the trees then continue up the face of the mountain in behind. Later, I moved closer to the trees and tried to get some different shots. 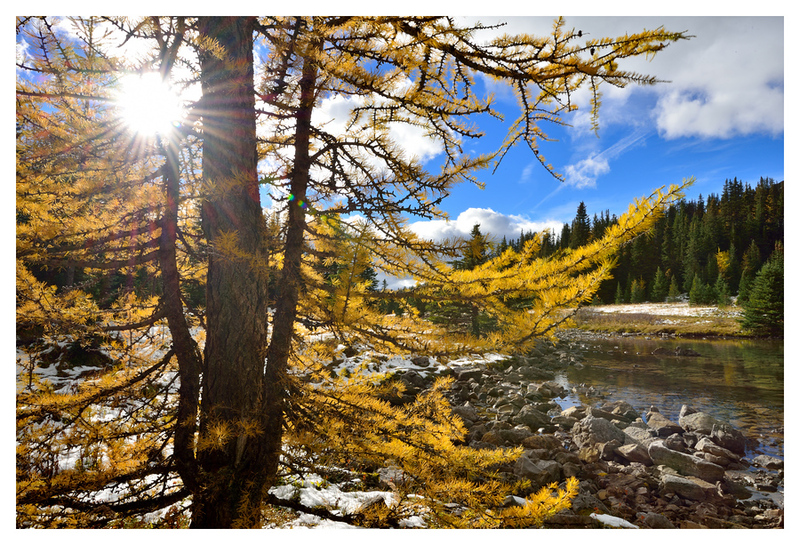 When I was on the lake oHara photo tour, Brian Merry - the guide, showed us how he uses the sun to create a starburst in the frame. 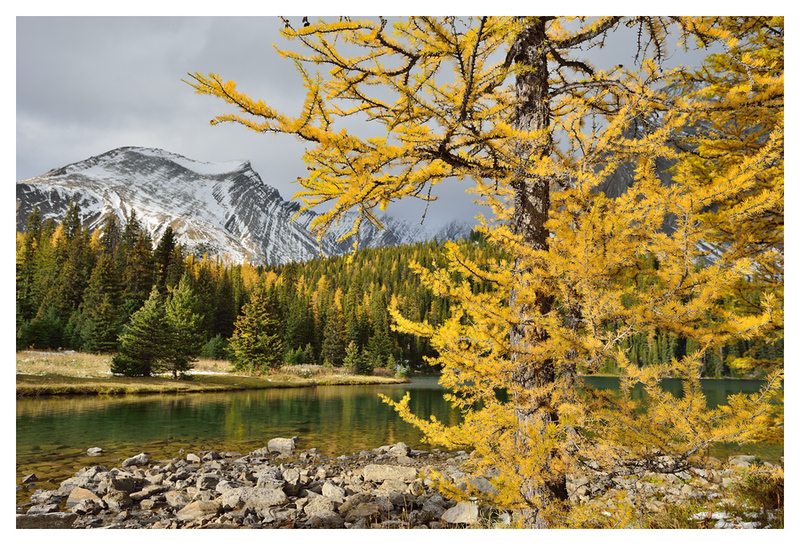 I thought I'd try it out and really liked the effect here with the blue sky complementing the yellow in the larch. The light was amazing considering when I left the parking lot, it was completely overcast and the light was very flat. 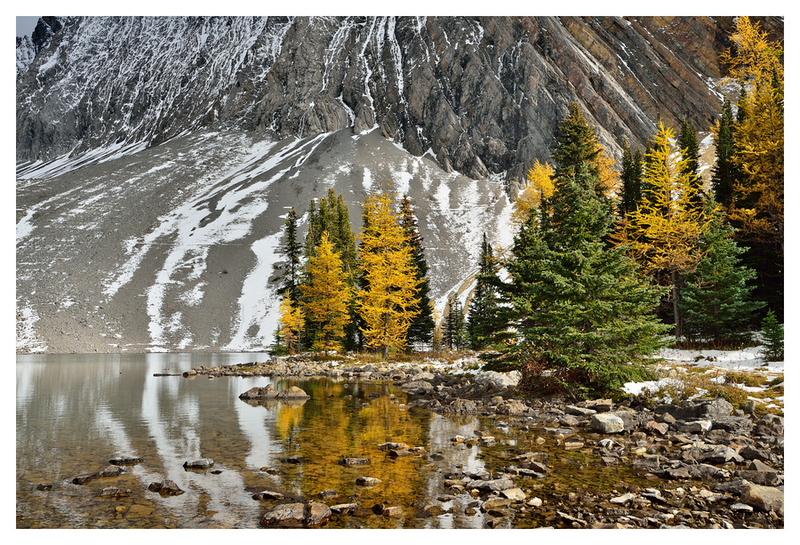 One last photo, with the branches of a larch tree framing Mt Galatea and Chester Lake. Leaving Chester lake and walking back to the car in the bright evening sun was magical. There was a feeling of calm and wonderment after the frantic run up to the lake facilitated by the thought that I'd experienced beautiful light and had captured some incredible photographs. Extra photos from today can be seen here.